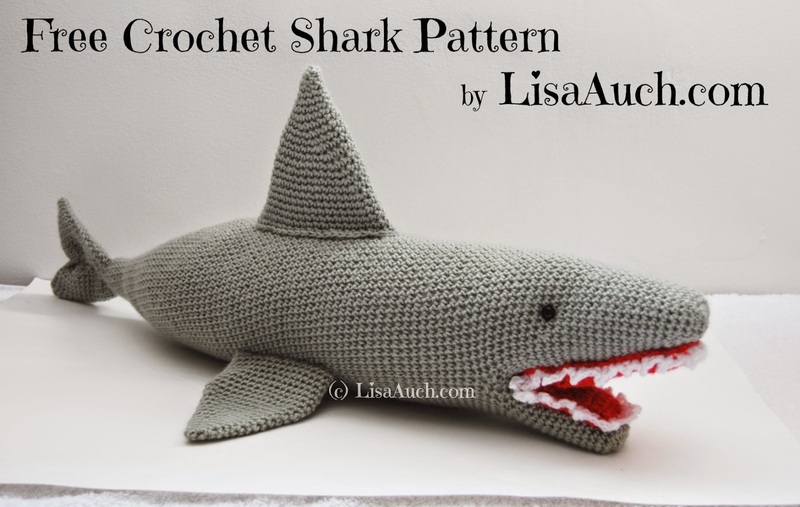 Free Crochet Shark Pattern by Lisa Auch. After visiting the local Sea life Centre with my Niece and Nephew, who fell in love with the sea life creatures, fishes and all the sharks we got to see. My adorable niece who is 5 and is in love with every animal, land or sea, you can possibly think of, challenged me to crochet her a .....SHARK, well who can resist her gorgeous pleading eyes? 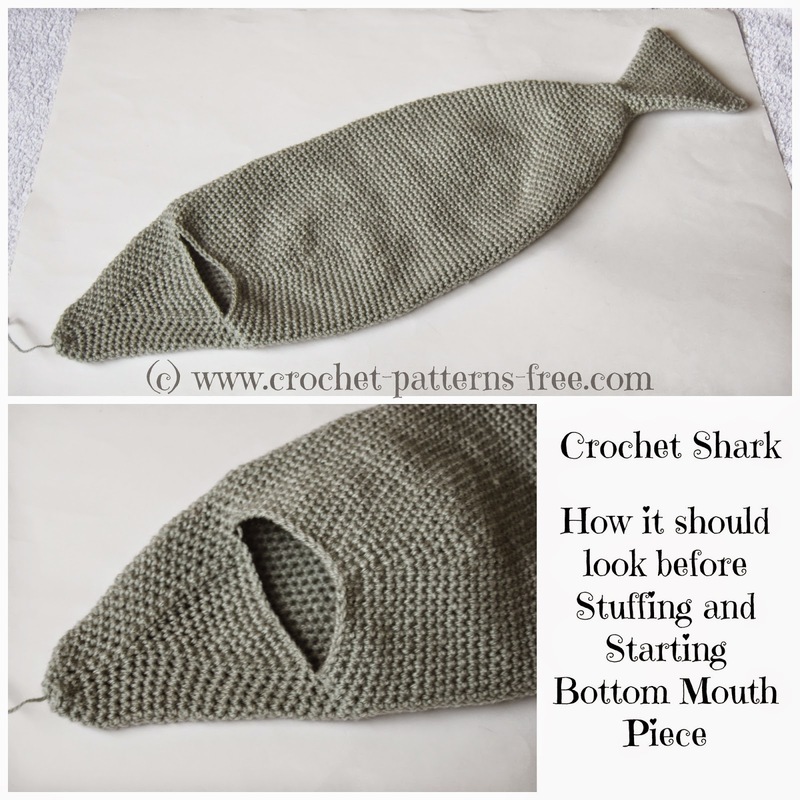 This pattern is as I made it, and when I shared the finished Sharks picture people asked for the pattern, it has not been tested, you should have a basic understanding of crocheting amigurumi style and reading such patterns. If you come across a glaring error in the pattern or numbers please do not hesitate to contact me so I can correct it. Your helpfulness helps others too. You Will Need 3.5mm hook. Some red and white yarn for the mouth and teeth. Use a stitch marker at the start of each and move upon completion of each round. the pattern for the shark is worked from the tail to the mouth, where we will split the piece and then work separately in rounds to make the opening for the mouth. finished and Stuffed the Shark is 25 inches long. ch 23, sc in 2nd stitch from hook, sc in each chain to last st ,work 2sc in last st.
Rnd 109:[sc in next 2 sts, 2sctog] repeat this around until you have 6sts left, fasten off and leave enough length to sew seams together. You can start to stuff the shark with the filling, ensuring it is evenly spread out along your sharks body. 2nd Mouth Section:(Hold the shark RS with the nose pointing up and start at the corner of the sharks mouth) move stitch marker after completion of every round. Rnd 16: 2sctog, sc in next 5 sts,2sctog,sc to lastt (12) Fasten off and sew across the seams to close. Fasten off , and leave a long tail to use later to sew and secure piece to the top of the shark. Fasten off neatly and leave enough to sew fins to the sharks body. fasten off and weave in end neatly. Join white yarn, to the red mouth piece just worked. slip stitch around the whole of the mouth. working into the white slip stitches just made work [sc in next st, hdc in next, dc in next, ch3, slip to join to the top of the dc,] repeat all the way around. Fasten off an weave in all ends.